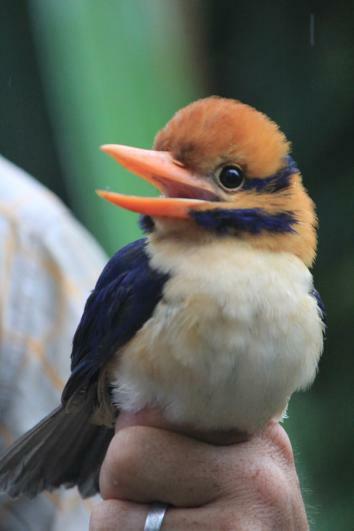 Mustached kingfisher photographed for first time: Proves it is definitely not a stuffed toy. Last week, a team led by Chris Filardi, director of Pacific Programs at the American Museum of Natural History’s Center for Biodiversity and Conservation, identified and photographed the first-ever male mustached kingfisher. It happened one fateful morning while the team was surveying biodiversity in the mountainous forests of the “sky island” of Guadalcanal in the Solomon Islands. * Suddenly, Filardi heard the unmistakable call: “ko-ko-ko-kokokokokokokoko-kiew!” A dark shape criss-crossed his path. And then, silhouetted against the dappled sunlight, he saw it: the mustached kingfisher in its full, mustachioed glory. He put down his binoculars. He didn’t need them anymore. Thanks to Filardi and his team, we can now describe the male’s plumage: His head is a burnt orange, his beak is a split-open carrot, and his “mustache” takes the form of two violet bands, one around his chin and the other extending from his eyes, lending him both decoration and dignity. He juts forth the pale roundness of his fluffy breast, indignant. 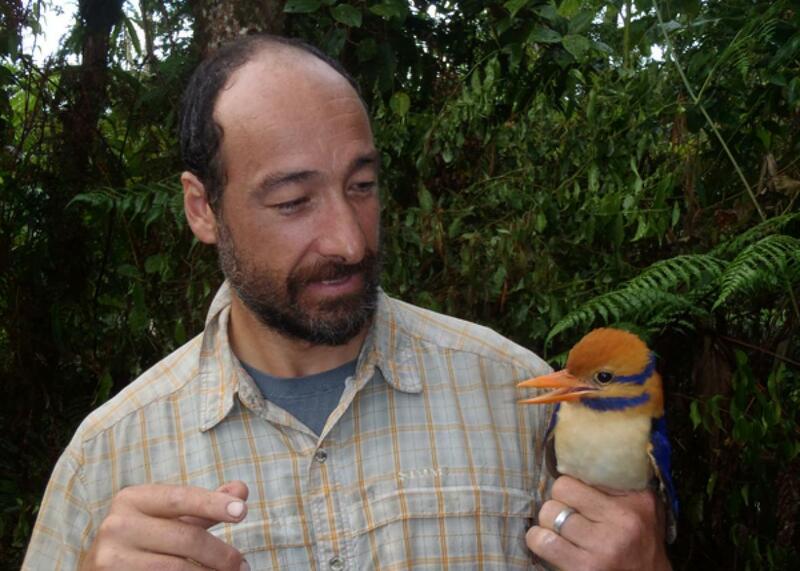 Filardi holding a puppet—I mean, mustached kingfisher. 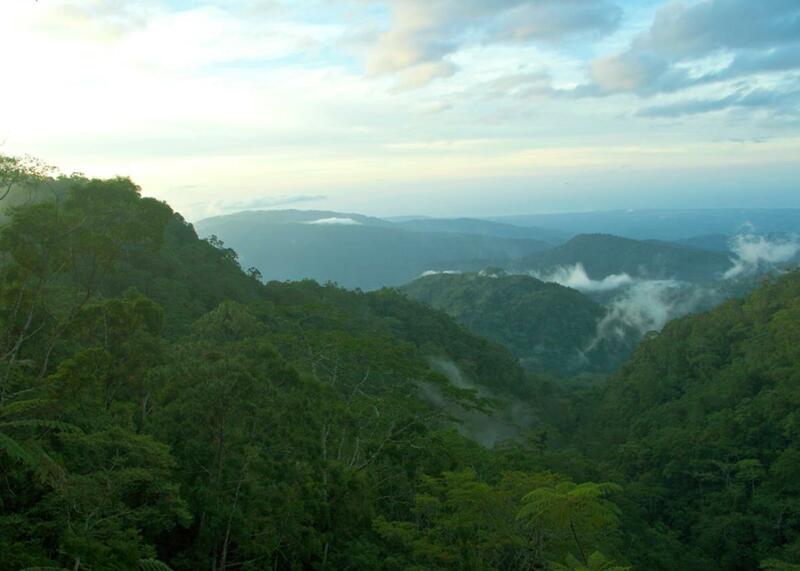 The remote “sky island” of Guadalcanal. The Uluna-Sutahuri people of Guadalcanal have long lived in the midst of this legendary bird, which is known to them as Mbarikuku. But this is the first time it has been photographed and recorded. Due to habitat degradation (logging) and deadly predators (pesky invasive cats), the kingfisher is exceedingly rare, with numbers estimated at between 250 and 1,000 and dwindling. 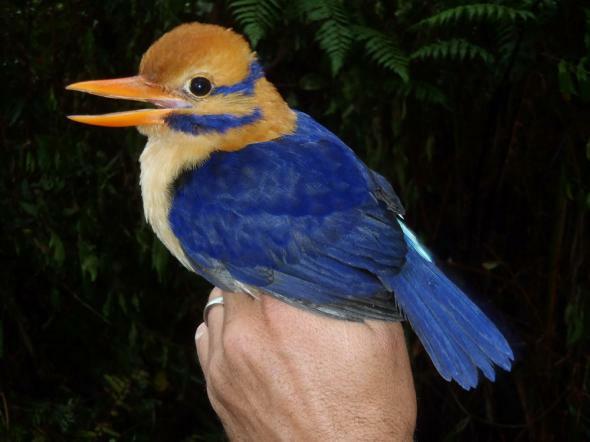 Previously, taxonomists had lumped together this bird and a very similar one, the larger Bougainville mustached kingfisher. The new observations made by Filardi’s team reveal that this is almost certainly its own species, based on its distinctive call, reproductive isolation and history, and “striking difference in plumage.” The next step is to run genetic tests on the captured specimen, to see how different the two species truly are. *Correction, Sept. 24, 2015: This post originally misstated that Guadalcanal is in Papua New Guinea. It is in the Solomon Islands.